Wearing almost her birthday suit, this bikini clad birthday girl bobblehead doll is standing astride a birthday cake with an age that can be customized by you! 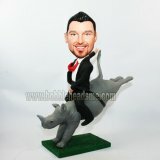 This customized bobblehead can give your significant one a big surprise with its extravaganza for her birthday. By this bobble, she can feel how deep is your love for her. Our good artists are wishing happy birthday to her, too!